Can you give us a quick overview of the Casio LampFreeTM Laser & LED Hybrid light source technology used in Casio Projectors? Casio introduced the World’s first Laser & LED Hybrid Light source projector more than three years ago and is now in its fourth year of mass production and third generation light engine. Casio’s high brightness, up to 4000 lumens, is achieved by combining red LEDs for red light with a blue laser array which is used for both blue and green Light. Casio’s unique phosphor element converts the blue laser light to high brightness green light. Using lasers and LEDs Casio can achieve the high brightness our users expect without the expense and hassle of mercury lamps. Total cost of Ownership (TCO) is often overlooked when it comes to projection systems. What should Houses of Worship look for when shopping for projection systems to reduce the overall total cost of ownership (TCO). HOW should look for projectors that have a light source with long life which will minimize replacement cost and downtime. Casio LampFreeTM projectors provide a significantly lower total cost of ownership (TCO) as our light source has an estimated operating life of 20,000 hours, which is 10 times a typical mercury lamp. If it’s a ceiling mounted projector with a typical mercury bulb it may need replacement once or twice, and if it’s a portable unit, probably three times over the projector’s lifetime. With the cost of a replacement lamp more than 30 percent of the capital cost of a projector, if you buy three replacements, you’ve spent as much on lamps as you did for the original unit. With no mercury lamp replacement Casio projectors also reduce costly downtime in addition to being eco-friendly. Users benefit from savings incurred for the labor required for lamp replacement and filter cleaning. In addition to experiencing little to no downtime due to bulb burnout, Casio LampFreeTM projectors are covered by a five-year/10,000 hour light source warranty making them worry free. What should be the most cost effective projection solution to invest in now? Lamp-free projectors are now main stream with brightness up to 6500 lumens and in the long run they will provide a reduced operating cost in terms of lamp replacement and labor as well as power consumption. When purchasing the projector you should consider the initial cost plus lamp replacement cost amortized over the estimated usage period for the projector. Typically a projector has a three to five year operating cycle before being replaced. During this time the cost of lamp replacements can easily exceed the initial hardware investment. In addition to eliminating the cost and hassle of mercury lamp replacement and disposal, Casio LampFree projectors utilize laser and LEDs which can consume less energy when operated in the eco mode. How challenging is it for a projector to overcome the ambient light of a house of worship? As most Houses of Worship are designed using ambient lighting as a primary light source it is always a challenge finding a location that ensures the screens are bright and visible to the entire congregation. In 2013, Casio began shipping a Dual Projection System which combines two 3500 lumen projectors with a proprietary control box for a light output of up to 6500 lumens. In addition to providing the high brightness needed for main sanctuary applications, the Dual Projection System provides a redundant backup ensuring services will continue even in the unlikely event of a projector failing. Is there a rule of thumb as to screen size based on the dimensions of the viewing space? Typically screen size should be determined based on the dimensions of the viewing space, the maximum distance from the screen and content. A general rule of thumb is the screen’s height should be ¼ the distance to the farthest seat for critical viewing (small font/Excel/CAD/HD), 1/6 the height for presentations (large font/PowerPoint/SD). Since most HOW’s will show a mix of content and HD video, 1/5 the maximum distance is recommended. We recommend working with your local Professional AV dealer or integrator to determine the proper screen size, material and location with your facility. Please explain why a different projection system may be required in a house of worship from let’s say a business conference room? A typical business conference room will have a maximum screen size of 100” diagonal where a House of Worship may start with a minimum screen size of 100” diagonal with even larger screens used in the biggest facilities. The larger the screen size the greater the demand on light output from a projector. The Casio Dual Projection System is designed for large screen projection and can provide the light output needed for large screens. What is the recommended method of control for a projection system in a house of worship? Since most projectors will be ceiling mounted in the House of Worship it is recommend some type of wired remote control be included when installing a projector. For a simple single projector you may choose a basic RS-232 control panel with simple Power On/Off controls as well as input selection. For larger installations with multiple projectors and sources and possible lighting and audio control it is recommended you use a touch control panel from one of the many available solutions. All Casio LampFree Projectors have RS-232 control as a standard feature and many models incorporate a LAN connection for control over a network. As LCD screens continue to grow in size while dropping in price, what are some of the reasons why a house of worship or similar venue should go with a projection system over flat screens. Screen size, if you need more than a 100” diagonal screen front projection is a more affordable solution and is ideally suited for delivering a large bright image. 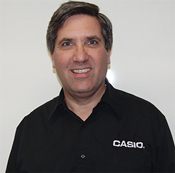 About Joe Gillio, Director of Product Management, Business Products Division For Casio America, Inc. Results oriented senior marketing executive with more than 20 years of product management experience in a global corporate environment. Demonstrated ability to plan, developed and launched new products resulting in product line sales and market share growth. A hands-on, self-starter focused on getting the job done and achieving corporate goals and objectives. Comfortable with technology and capable of marketing to a diverse audience including consumers, buyers, dealers and media.